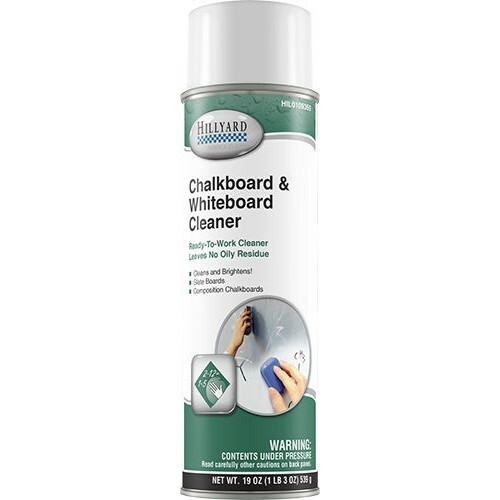 Give any chalkboard or whiteboard the like new look with Chalkboard & Whiteboard Cleaner. An ideal product for use in schools, hotels, motels, institutions, offices, factories and churches. Formulated to clean whiteboards as well as traditional slate chalkboards and has no oily residue. Relieves eyestrain by giving greater contrast and removing ghost images from repeated use. The easy to use high foaming aerosol puts product where you want it with a maximum vertical cling and eliminates the drippy wet mess. The unique 360 degree valve allows for spraying in any position while the pleasant fragrance leaves the area smelling fresh and clean. Non flamible and waterbased, this product contains no ozone depleters and is low in VOC content.